We knew somehow, someway, we would be discussing Bernard Tomic after his 1st round match with Fernando Verdasco. We dubbed the tilt our Super Fan Special in that section of the draw, figuring it was going to be a barnburner. There were some shaky moments, but the 19 year old certainly made sure the boisterous crowd got their money's worth on Rod Laver Arena. Tomic edged past the 22nd seeded Verdasco 4-6 6-7 (3) 6-4 6-2 7-5 in more than four hours to get this Aussie Open off to a rip-roaring start. It was a tough draw for Verdasco, ranked 24 himself playing the World No. 38 who narrowly missed being seeded himself. Add to that, he was playing the No. 1 Aussie on Rod Laver Arena in the opening match of the tournament and it was a recipe for disaster for the Spaniard...until it wasn't. The last time we saw Verdasco, well, he wasn't wearing this (err, loud) gear, but more importantly, he had been demoted to doubles specialist for the mighty Spanish Davis Cup team...and he couldn't win at that; forcing his compatriot Rafael Nadal into the breach once more to secure La Copa Davis for Spain. 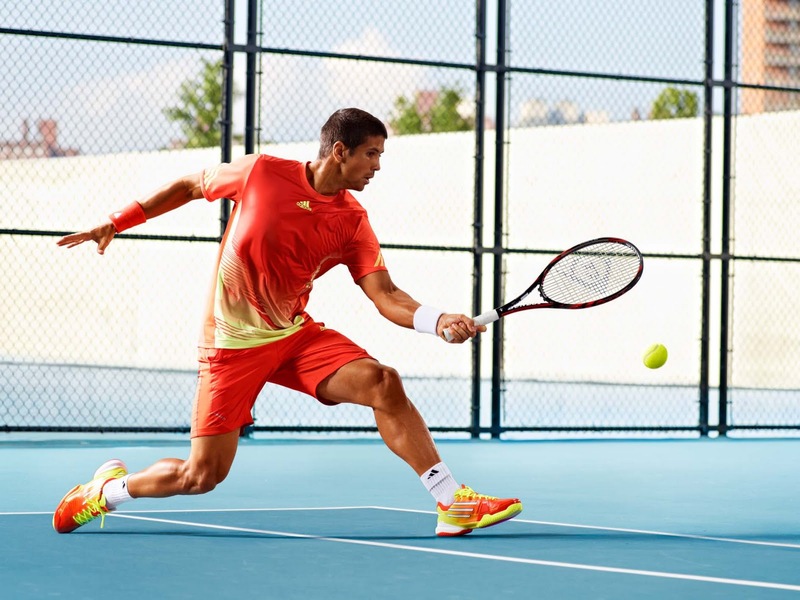 Against Tomic, Verdasco looked set to grind his way to a win. There was nothing spectacular there, but he was consistent. Tomic's funky game wasn't firing yet and the long-heralded future of Aussie tennis was on the ropes, down two sets to love. Then suddenly, a break in the third set to Tomic and he was off to the races, taking that set and eventually the match. As much as you can say about someone very much in the formative stages of his career, Tomic looks to be for real. He's got the guts of a champion much like his compatriot Lleyton Hewitt, unlike Hewitt, he's got the size as well. The ATP lists him at 6'5" 201 which puts him on par with Tomas Berdych and a smidge smaller than Juan Martin Del Potro. 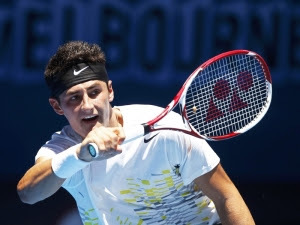 With the establishment of the ATP ripe for some turnover after the Olympics, Tomic is making his bid for a seat at the big boys table on the game's biggest stages. The seat Verdasco once had at that table looks pretty open these days. It's early days for our pre-tournament pick Victoria Azarenka, but she was in ominous form in her first match of the 2012 Australian Open. Heather Watson, the 105th ranked British 19 year old plays a solid game of tennis, nice power, good court speed, solid ball-striking. All that notwithstanding, she was throttled by the 3rd ranked Belarussian 6-1, 6-0. It was like the second coming of Steffi Graf for an hour out there on Laver Arena. Watson looked good, but there was absolutely nothing Azarenka didn't do better...as well she should, she's ranked over 100 places higher. There's been a lot of chatter about Azarenka's newfound calm this season and it was certainly on display today. Azarenka was businesslike through the match and all the way to ESPN's interview room, refusing (again) to be drawn into the discussion about the No. 1 ranking and instead focusing on the fact that she has six matches to go and a tournament she might just be able to win. Determination...it's a good look for Vikarenka. How much can you read into a top player's first round matches? If they win, not a ton. They could be trying new things with their games, working through strategic adjustments; playing against an unknown opponent, shaking off the cobwebs, etc. If they lose, you can analyze plenty, but there's so much tournament in front of you at that point that, who has the time? Today, Rafael Nadal hit the court versus 24 year old American Alex Kunetsov. Once a top prospect, Kuznetsov showed plenty of game planting down the line forehands right on the baseline, matching Nadal's power and moving around the court well. Despite going up an early break, Nadal won what would be a tense opening set 6-4, then the Spaniard tightened the screws. Nadal came into this Australian Open dogged by question marks: the shoulder, the rival, the new equipment, the railing against the schedule (and Federer); he immediately added a big one to the top of the list: a right knee that looked all but under the mummification process it was under so much strapping. It was said to be precautionary, but so it was in 2009 as well. You remember 2009, the year that Roland Garros didn't really happen because Nadal wasn't there to collect the Coupe Des Mousquetaires? All that said, Nadal answered at least one of the many questions around his neck in today's match. There will be no adjustment period to the new stick. 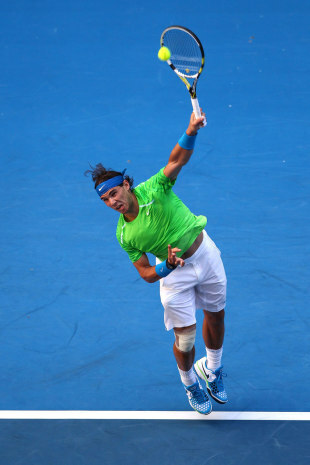 Nadal played a comprehensive match outgunning a game, but ultimately defenseless Kuznetsov 6-4, 6-1, 6-1. Nadal started his tourney with a young gun, next up and old timer, Tommy Haas in the second round. Hopefully, once he's there, Nadal will answer even more questions. Good write-ups (as usual, actually) I have been here b4! Interesting times with those youngsters around - but still I can only go Vamos Rafa! Rafur, keep visiting. We're glad you're checking us out. There's a few Rafa fans around these parts.